The Short Version: Anova wants to demystify a kitchen technique that only sounds intimidating: sous vide (pronounced sue-veed). A method long used by restaurant chefs, sous vide cooking creates a precise water temperature that heats meats, vegetables, and even desserts to perfection. 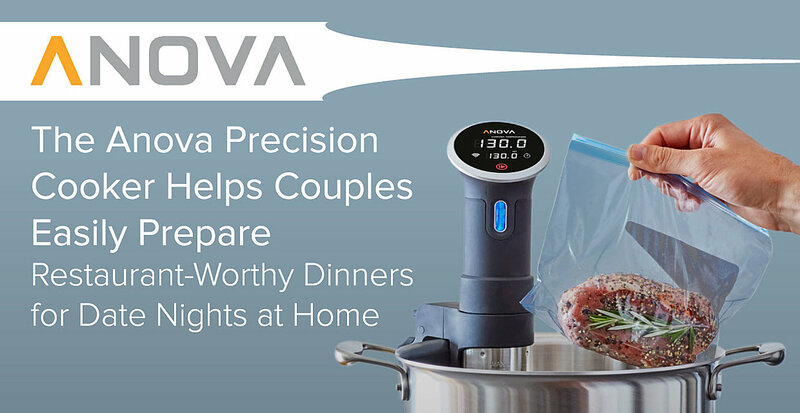 The Anova Precision Cooker is an affordable, simple sous vide tool that can help couples who don’t want to spend their entire date night standing over a hot stove. Many people feel intimidated by the prospect of cooking a delicious dinner with a special someone. Some worry about overcooking their meat in the oven or undercooking it in a skillet. Though plenty of people enjoy making meals, they may find the process too time-consuming, or they discover that whatever dish they plan to make isn’t as mouth-watering as restaurant-quality takeout. Many home cooks — both novice and skilled — can overcome those obstacles with the sous vide (pronounced sue-veed) cooking technique. 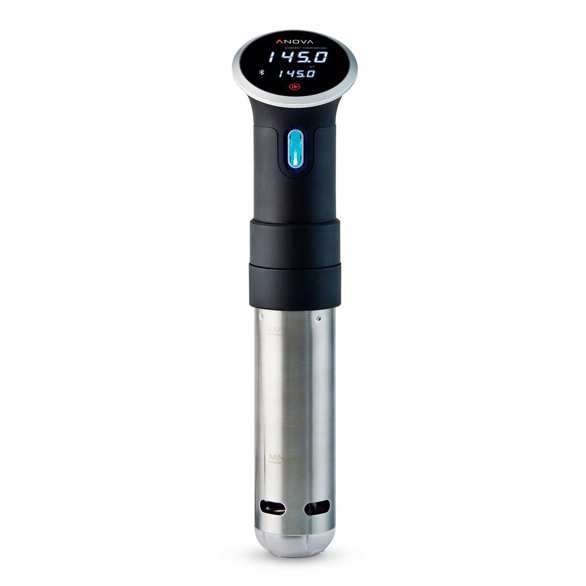 Most often used by restaurant chefs, sous vide heats water to a specific temperature using precision control. Ovens and stove-top burners can’t achieve such exact temperatures. After spending time submerged in water in airtight bags, meats, vegetables, or even desserts will be cooked to perfection. Anova makes tools that make the sous vide technique accessible to everyone, said Cole Wagoner, the company’s Social Media Manager. Sous vide cooking eliminates the worry of undercooking or overcooking a dinner. For example, if you heat your oven to 400 degrees, you only have a small window of time to cook food at that temperature. With the Anova Precision Cooker, the food is cooked at an exact temperature the entire time. The sous vide method also requires less monitoring than other techniques. Though sous vide is often associated with cooking meat, especially steak, the method can be used for all types of food. With an Anova Precision Cooker, you can prepare all kinds of meats and vegetables, including softer vegetables like corn on the cob or asparagus. “You could even make mason jar desserts, like creme brulee or chocolate pot de créme,” Cole said. Unlike other precision cookers, the Anova version is designed for all types of cooks. The recipes posted on the website are simple enough that anyone can make them — and that is by design. The Anova Precision Cooker allows people to cook great meals while staying out of the kitchen. Anova chefs share their recipes for sous vide meals for all times of day, including Sous Vide Egg Bites with cream cheese, cottage cheese, and red peppers for breakfast. These recipes come from both professional chefs and home cooks around the country. Home cooks, who call themselves “Anova food nerds “ (or #anovafoodnerds on social media), also value sharing their creations. Making tasty recipes and posting them on the Anova platform is a big deal for sous vide aficionados. Hundreds of Anova users may try out their recipe. The company benefits, too, because home cook-created recipes demonstrate that anyone can master — and improve upon — sous vide cooking. One user shared his tried-and-true recipe for Sous Vide Pork Loin to much fanfare. It has been made more than 1,800 times, and the recipe has earned a four-star rating. Couples who want to cook together can use the Anova to create the kind of meals they typically only enjoy at restaurants. For date night, couples can make an entree and a dessert using the Anova Precision Cooker. Dinner could start with a Sous Vide Ribeye Steak that’s seasoned with thyme and rosemary and cooked for one to four hours, depending on how well-done they like the meat. After the sous vide process is finished, it only takes a minute or two to create a perfect sear in a cast iron skillet or pan. “The food comes out completely cooked, but there’s no caramelization,” Cole explains. “You can add more seasoning and put it in a cast iron skillet or a grill for 30 seconds or a minute for a very brief sear.” On the side, serve Butter-Poached Potatoes. Sous vide simplifies the process of cooking both meats and desserts — like red wine-poached pears. The range of desserts that can be made using the sous vide technique may also be surprising. Red Wine-Poached Pears are a favorite dessert within the Anova community — and a romantic finish for a date night meal. After an hour of sous vide cooking, pears, red wine, cinnamon, vanilla beans, sugar, and cloves come together to make an aromatic dessert experience. You can then serve the pears with vanilla ice cream. Couples aren’t the only Anova users, though. The tool also empowers anyone to cook a savory meal — whether it’s for themselves or for a date they want to impress. When the Anova Precision Cooker was first introduced, it attracted a different audience than it does now. At first, mostly tech-driven “gadget guys” bought the cooker as a novelty than as part of a lifestyle, Cole said. However, the tool has become more mainstream, a shift that the company continues to emphasize. 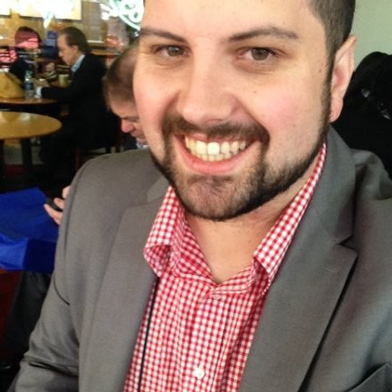 Cole Wagoner, Anova’s Social Media Manager, is excited about how many people are trying the sous vide method. Recently, the company unveiled the Nano Precision Cooker, which retails for under $100. Both the regular-size and the nano-size precision cookers are designed to reach a broader audience, and the price points make the tools widely appealing. Couples tired of takeout — and the hefty price tag that requires — have started to use the cooker to save money while they explore a new cooking method. That theme of affordability continues with the recipes that Anova posts. Instead of suggesting that the community buy complex ingredients at high-end stores, Anova focuses on ingredients that can be found at any grocery store. Cole said he feels heartened by the increasing popularity of sous vide cooking at home.